Following the steps of the “stampeders” over the Chilkoot Pass. The Trail, which was crossed by more than 100 000 men und women, explorers and thieves at the end of the 18th century on their way to Klondike goldfields, was an old traditional trade route between the first nations and the costal people. The chilkoot first nations carried fish-oil and seafood over the 1140 meter high pass to the Athabaskans and traded it for leather and furs. Finally in 1897, when the news from the gold discovery at the small Klondike river reached America, within days thousands of people rushed north to the Yukon. 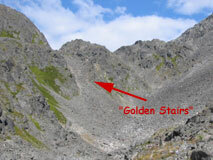 The stream of goldseekers – also named ‘stampeders’, because they were running like caddle and nothing could stop them – swelling in the next weeks to more than 100 000 people. More than the half of these exploreres never reached the Klondike. Enjoy this unique trekking tour without a guide. We will be happy to help you with the organization, planning of the process, reservation of trail and park permits as well as with the transfers. The lenght of the trail from Dyea to Lake Bennett is 53 km (33 miles). The elevation of the Chilkoot Pass is 1150 meter or 3750 feet. You should plan between 4 to 6 days for your hike. We arrange all reservations with Parks Canada in Whitehorse and provide the permits. You drive with the bus from White Pass & Yukon Route from Whitehorse to Fraser (American border, Passport required). From there you continue by train on the historic railway over the White Pass to Skagway. After you have picked up your trail permits at the Parks Building, our partner will shuttle you to Dyea, the starting point of the Chilkoot Trail. 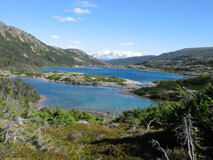 You hike to Lake Bennett and take the train from White Pass & Yukon Route to Fraser. We will pick you up at an arranged time and drive back to Whitehorse. You hike to Lake Bennett and we arrange your fly-out with the float plane to Whitehorse. The fly-out with the floatplane is not included in the tour price. In addition you can extend your flight and include a glacier tour over the glaciers of the White Pass area. Camping is only allowed in designated camp sites. 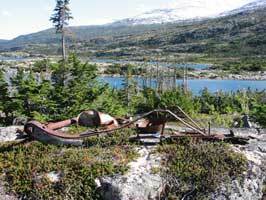 There are serveral camps along the Chilkoot Trail. With your trail reservation at Parks Canada we have to provide your trip itinerary to reserve your camp sites. You are absolutely on your own and you have to carry all your equipment you need to manage the trail by yourself. Open fires are not permitted! Don’t forget to bring your stove and additional fuel. We rent equipment, if needed ! You should plan between 4 to 6 days for your hike. All prices are in Canadian dollars plus 5% GST. All old remains and artefactes on the trail are protected by Parks Canada and the American and Canadian Gouvernment. Don’t take any objects as a souvenir !!! During the hike you have to carry your backpack yourself. We don’t provide porter service. Please make sure before you start your trip, that you have all required documentations and visas to travel within the USA. 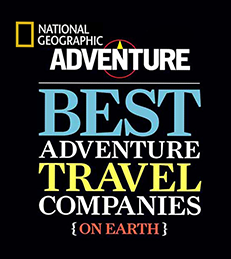 Yukon Wide Adventures is not responsible in the case that you are refused entry into the USA.